These days I seem to spend my life waiting for deliveries. The principal culprit in all of this is my lovely husband, who has a really bad internet shopping habit. Wild horses won't drag that man to a bricks-and-mortar shop, but boy does he know how to burn his plastic on-line! Most of what he buys is boring tech-stuff that I never even knew we needed, but someone has to be on duty when the precious consignment hits the doorstep. And today, that honour falls to Maxi and me. And we're more than just a little bit bored with how it's cramping our style. Of course, it helps that it's raining outside and blowing a gale (no surprise there, we're in London and it's February), but still we'd like to have the option of going on one of our 'Big Out-of-Doors Adventures'. To pass the time, because I can't seem to settle my head for any proper work, I've been playing about with scraps of wool. After my efforts the other day with the Skinny Heart Lavender Sachet I got to thinking that it might be nice to make some smaller lavender sachets to use with my woollen jumpers, which are always vulnerable to moth attacks. 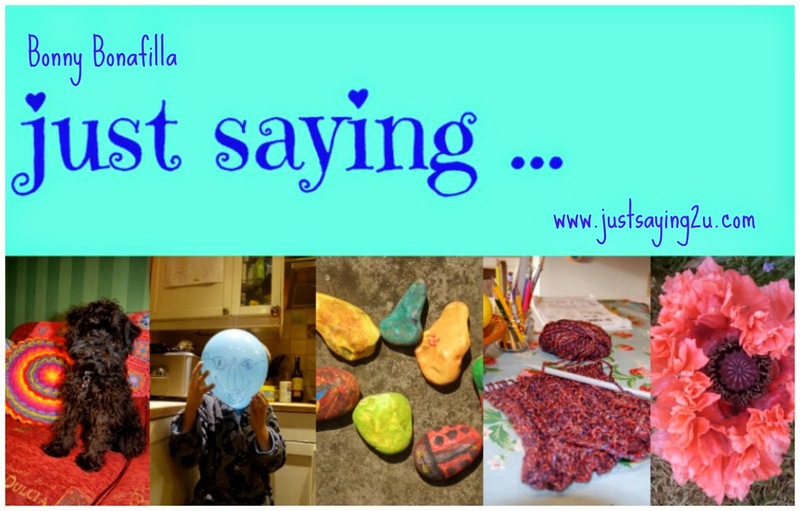 It's a variation on the Skinny Heart that I wrote about before, but this one is smaller and not quite so skinny - more of a Sweetheart heart (of the fizzy sweets fame). I added a rosette flower, which borrows more from the prize rosettes down at the pony club than anything Mother Nature ever conceived of. It's very quick and easy to make as I used treble stitch for speed. I'm aiming for a lot of sachets in as little time as possible. If you'd like to have a go at my variation on a theme here's what you need, and how to go about it. At the end of each row you should chain 3 to turn, which is not included in the instructions below. Join together with contrasting yarn using DC stitch. Chain 4 in centre colour (green in my case), and join with a Slip Stitch. Change to petal colour (pink double knitting wool in my case). Slip Stitch to join. Chain 3, 1 double treble crochet (DTC), Chain 3 into the same stitch as the original slip stitch. *Slip stitch into next stitch, Chain 3, 1 DTC, Chain 3, all into same stitch*. Repeat from * to * all the way round to create 12 petals. 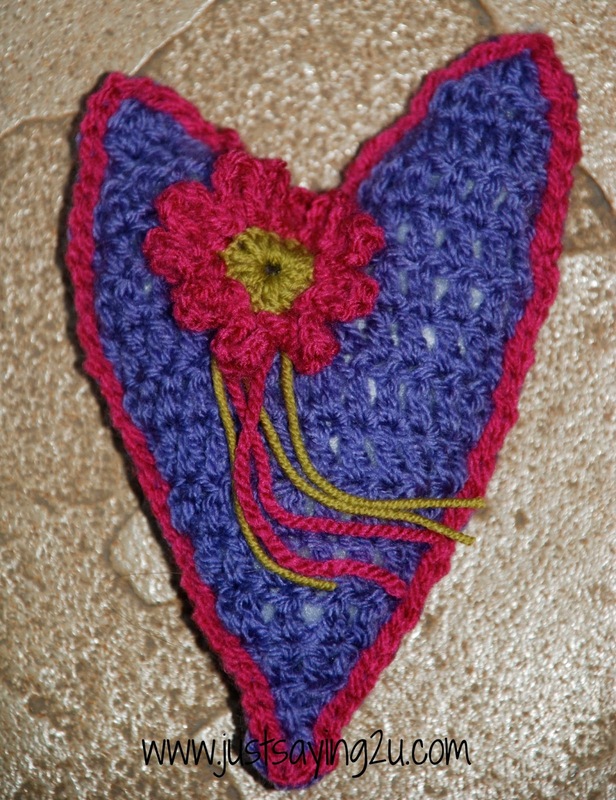 Fasten off, weave in ends - or leave them loose and trim like the tail of a rosette - and attach to the crochet heart.